Our personalised sew in clothes labels are available in several sizes including the popular 10mm and 25mm varities, they are made from British made satin ribbon which is high quality and gives a luxurious feel. 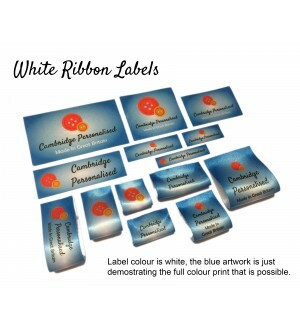 You can personalise your labels exactly how you want them e.g. text, motif and print colour etc. The 25mm labels allow up-to four lines of text on the front and also text on the back which is ideal for medical or contact details etc. The 10mm is smaller and only allows two lines of text on the front e.g. James Smith Class 1. All of our labels are made using bespoke production processes, this means they are longer-lasting and won't fade unlike cheaper alternatives. New customer or design? Please click here instead.Personalised Folded or Flat Custom Sew In Fabric Labels - Add a professional finished.. Existing customer or design (repeat order)? Please click here instead.Personalised Folded or Flat Custom Sew In Fabric Labels - Add a profes..